Red Fin Borleyi cichlids are found throughout the rocky areas along the Kadango shores of lake Malawi. This fish got it’s name because the juveniles and females both sport red finnage on them, making them some of the more attractive young haps available. Copadichromis Borleyi are one of the few species that will “school” around together in the tank when the males are not breeding. We suggest feeding this carnivorous species our Plankton Gold Flake with the occasional treat of frozen brine shrimp. As they get larger you will want to move up to a pellet type food. This lake Malawi hap cichlid is one of the faster growing fish out there. Keep this in mind when stocking them as they will get to be around 8” inches when fully grown. 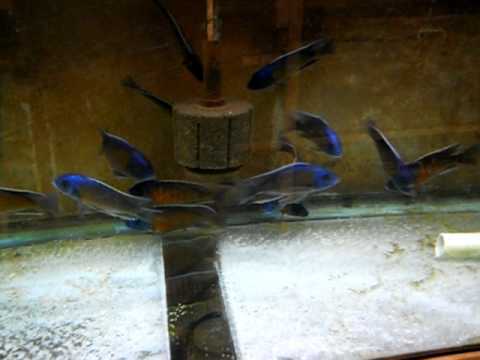 We have several Copadichromis Borleyi cichlids for sale with guaranteed live arrival shipping. Buy 3 or more to take advantage of our bulk order discounts.